I suffer from depression. I know I've shared that before, but thought that maybe right now, at this very minute, there might be somebody reading this who needs to know that you're not alone in your own suffering. See, that's the thing with me and maybe you, too. When I get down and feel like I'm totally alone and nobody understands I fail to remember that somebody else out there is going through something very similar, who has the same struggles and trials and thoughts running through their minds as I do. They're more than likely spending many restless nights worrying and wondering and pondering on the wrong things. Even at my age I fail to remember when I get in one of those dark places that Satan is so very much enjoying seeing me like that because he knows that I'm not depending on the Lord like I should. Sometimes I arrogantly think that I've got this depression thing licked.....it's behind me and I'm so happy I don't have to be concerned with it rearing its ugly head again. It's about that time that something happens in my life to trigger the anger (that's usually how mine starts) and then it's a downward spiral until I find myself in a very dark place and feel there's NEVER going to be any light at the end of the tunnel. That's where I've been for the last couple of weeks. This time, it's lasted longer than normal for me. "My grace is all you need. My power works best in weakness". 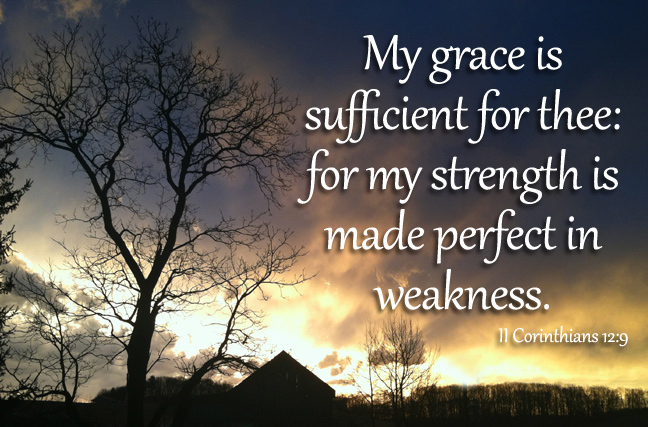 For when I am weak, then I am strong! If you see yourself in my words, PLEASE find somebody to talk to. I love my husband dearly, but he has never understood my depression, which makes matters worse for me. Sometimes after SONday school, a lady in our class will come and sit behind me for a few minutes in the sanctuary before the service starts and we'll chat. This past SONday she leaned really close and spoke to me and simply said "how are you doing". Before I even realized it, I said "Will you pray for me? I suffer from depression and this past week has been really difficult?" That had to be the Holy Spirit, because it is so unlike me to share that with anybody. She told me after church that she was so honored that I had asked her to pray for me. See how God works? This lady needed the blessing of me asking her to pray for me as much as I needed prayer. I'm going to close the comments on this post because I'm not writing for sympathy.....and maybe I'm a bit afraid of criticism, too. If you have something you want to share, or are in need of prayer for your own depression or anything else you might be going through, you can e-mail me at wiseoldowldesigns@comcast.net. I'm seeing Light at the end of the tunnel. Thank you, sweet Lord for your love and mercy and kindness and grace. I'm trying desperately to BREATHE You in! (Thank you, Ms. Beckey for your cell phone number. I truly wanted to text you for prayer but was too prideful to ask.